Over the last few weeks the LHC controllers have been working towards an improved luminosity target using squeezed beams. This morning they succeeded when they declared stable beams using the new configuration. 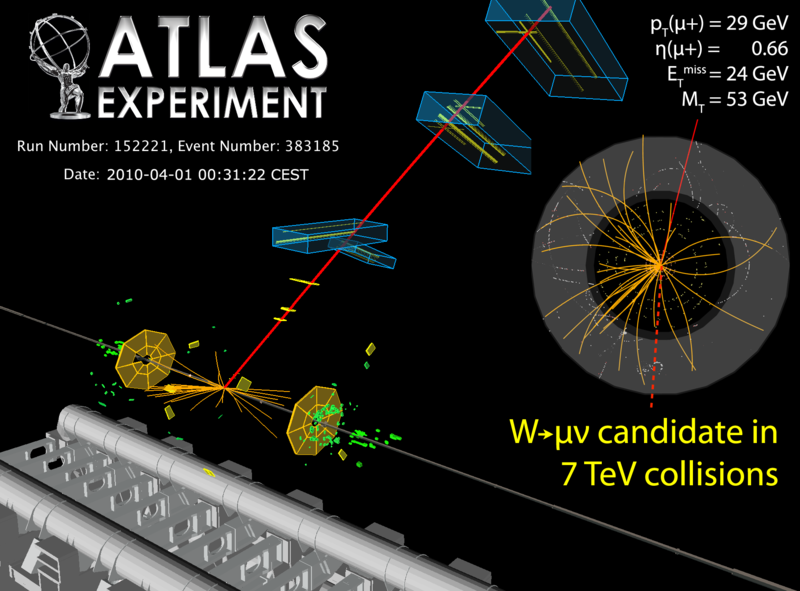 Since the 30th march when the protons were collided at 3.5TeV per beam for the first time, they have been running with a configuration of 3.5TeV/11m/10Billion/2-bunches (energy per beam/beta/protons per bunch/bunches per beam). The new configuration is 3.5TeV/2m/12Billion/3-bunches. This should increase the luminosity by a factor of about 10 (x5 from the squeeze and x2 from the bunches) but they may need to do some luminosity scans to reposition the beams before they actually increase the collision rate by that amount. The bucket configuration being used is (1, 8941, 17851) for beam 1 and (1, 8911, 17851) for beam 2. The total number of buckets is determined by the frequency of the RF fields used to accelerate the beam and the size of the collider ring. The result is that there are exactly 35640 buckets in each beam where the bunches of protons can be positioned. The bunches are injected from the SPS ring into the main LHC ring with careful timing so that they are placed in the buckets the controllers want. The buckets chosen determine where the protons in the two beams will cross over and collide. bunches in bucket 1 for beam 1 and bucket 1 for beam 2 circulate in opposite directions so they will come together at two points diametrically opposite around the ring. These two points are called IP1 and IP5 and these are where the two biggest experiments live (ATLAS and CMS) . Other bunches that are in the same bucket number will also collide at these points. E.g with todays bucket numbers the bunches in bucket 17851 of either beam will also collide in ATLAS and CMS, but the bunches in buckets 8941 and 8911 will miss, so these experiments are now getting twice as many collisions as the previous configuration. 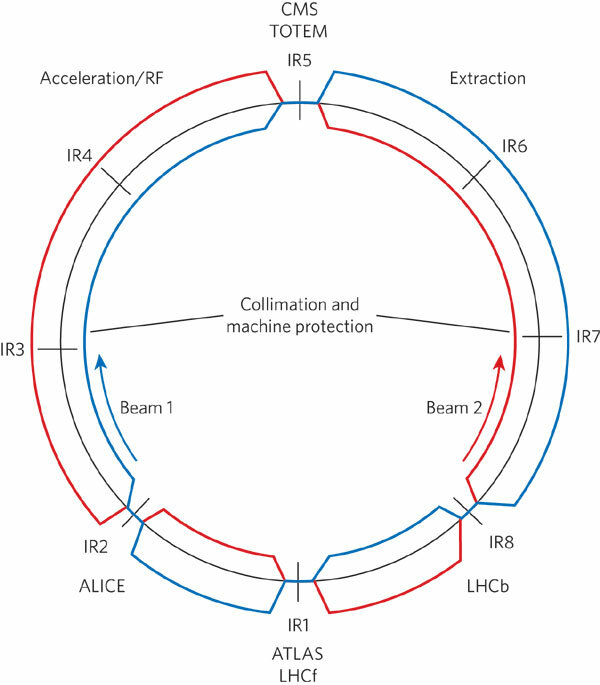 The other bucket numbers are chosen to provide collisions at the other two intersection points IP2 (ALICE), and IP8 (LHCb) The point IP2 is exactly one eighth of the way round the collider ring so bunches will collide there when the difference of bunch numbers (b2 – b1) is exactly 35640/4 = 8910, so with today’s configuration the bunch in bucket 8911 of beam 2 collides with the bunch in bucket 1 of beam 1, and 17851 of beam 2 collides with 8941 of beam 1. So ALICE is also getting twice as many bunches colliding as before. Finally, LHCb at IP8 is at a point approximately one eighth of the way round the ring in the other direction, but because of the nature of the detector its collision point is 11.5 meters away from the exact point. This means that the difference in bucket numbers must be -8940 rather than the more convenient -8910. With the new numbers we have bucket 8941 of beam 1 colliding with bucket 1 of beam 2 and bucket 17851 of beam 1 colliding with 8911 of beam 2. So LHCb also sees two collisions for every circuit of the ring and the controllers have been fair to each of the experiments. As the number of bunches is increased the controllers will have to work harder to find the best bucket numbers. For CMS and ATLAS they want all bunches in equal bucket numbers to maximise the number of collisions. To please ALICE they should place them at intervals a quarter of the way round. Four bunches in buckets (1,8911, 17821, 26731) for both beams would be ideal for CMS, ALICE and ATLAS who would each see four collisions per circuit, but would fail for LHCb. They will have to offset the bucket numbers to get the best results. As the number of bunches gets larger the problem eases. If they could have 1188 bunches placed at 30 bucket intervals then all four experiments would be seeing 1188 collisions per circuit. In practice this is not possible because some gaps must be left to allow safe dumping of the beams at the end of each run. The bunches must also be at least 10 bucket numbers apart. There are other constraints depending on how bunches can be injected and various other considerations. In fact the highest number of bunches planned is 2808 per beam. Before they get there we will see them go through other carefully worked out bucket schemes with possibly 16, 43, 96, 156 or 936 bunches per beam. Juggling the precise bucket numbers to please all the experiments is going to be a delicate business. James Lovelock is the first scientist in this series who is still alive. This also means that some of his work remains controversial, but a great deal of his research that was originally attacked is now widely accepted. As a child, Lovelock was fascinated by science and read many books about physics and chemistry at the library. His school life was not very happy and his teachers did not rate him very highly. Towards the end of his secondary schooling he took part in a written test on general knowledge and came top. His teachers were indignant. Although he was interested in a broad range of science topics he went on to study chemistry at university because he had a form of dyslexia that made it difficult for him to succeed in more mathematical subjects such as physics. He went on to work for the Medical Research Council and gained a doctorate in medicine in 1948. He invented a number of detection devices including the electron capture detector which made it possible to detect very small amounts of certain chemicals in the atmosphere. Although he has at times worked for various institutions and universities he has done most of his research as an independent scientist funded by revenues from his inventions. Working from his home laboratory, Lovelock decided to investigate the effects of human pollution on atmospheric conditions such as haze. He used his electron capture detector to measure concentrations of CFC compounds in the atmosphere and correlated the results with conditions of visibility,finding a strong relationship. Because CFCs have no natural origin this demonstrated a clear link between pollution and its effects on the weather. The work drew attention to the buildup of CFC’s in the atmosphere which nobody else had measured before Lovelock. It was then realised by others that CFC gases were harming the ozone layer that protects us from ultraviolet radiation and a worldwide ban on the substances was put in place preventing a natural disaster. In 1974 Frank Rowland and Mario Molina were awarded the Nobel prize for this discovery. Once again we see how the most independent thinkers seem to make discoveries that lead to Nobel Prices for others who work in a more institutionalised environment. Lovelock established a good reputation through his work and was called on by NASA when they wanted to develop tests that would detect life on Mars. Lovelock worked with other scientists on the project but became critical of the approaches others were taking. The director told him he must produce a good test himself or leave the team. He came back with the suggestion that they should measure the composition of the Martian atmosphere because if there was life on Mars it would result in a mixture of compounds that would be hard to explain through inorganic processes. This idea had the benefit that it could be carried out without sending probes to Mars and measurements were soon taken showing that the atmosphere was almost entirely carbon dioxide. It was concluded that there is probably very little or no life on Mars at this time. It was inspiration from this work that led Lovelock to the hypothesis for which he is now well-known. He suggested that the atmosphere and climate on Earth is not just affected by life, it is actually controlled by it. The temperature of our atmosphere can be controlled by phytoplankton that live in the upper sunlit layers of the ocean. In response to the sunlight they produce chemicals that rise in the atmosphere and increase the cloud levels. This in turns cools the planet. Carbon dioxide levels can be controlled by algae that bloom when there are high concentrations of the gas. This removes the carbon dioxide and deposits it on the seafloor. Even oxygen levels are controlled by vegetation that will burn more frequently when concentrations get too high. At first Lovelock’s hypothesis did not get much attention so in 1979 he gave it a catchy name and wrote a popular book about it: “Gaia: A New Look at Life on Earth” In the book he described the earth as acting like a superorganism that self regulates its systems. The reaction was probably not quite what he had anticipated. The cause was taken up by New Age thinkers in ways he did not particularly like. Evolutionary scientists such as Dawkins, Gould and Doolittle attacked the idea, saying that it was not consistent with evolution. Lovelock was not anti-evolution and set about more research aimed at showing how the Gaia hypothesis could arise naturally. Eventually he started to receive more support for his work. Thrity years later scientists now accept that there are strong links between biological systems and the way our atmosphere is regulated by nature, much as Lovelock proposed. The way such systems developed is still open to question. Lovelock went on to suggest that human activity is now upsetting the balance that nature established and this has set the foundations of the environmentalist movement. At 86 Lovelock is no longer considered a crank. He is appreciated as the founder of a new area of science investigating the relationship between biological systems and the atmosphere. Without his insight we would have been much slower to understand the negative effects we have been having on our climate through pollution. Fritz Zwicky was a Swiss astronomer who worked most of his life at Caltech in the US. He had a good reputation as an astronomical observer but his real passion was for astronomical theory based on applications of physics. He was in fact one of the first true astrophysicists from the 1920s onwards. But during most of his lifetime he was very underappreciated for his theories of cosmology and stellar physics. In fact that is really putting it mildly. Many of his colleagues were very hostile towards him and his theories. Of the scientists described in this series he is arguably the one who was most regarded as a “crackpot”. That is until many of his ideas were proved right many years later. Zwicky had a remarkable ability to consider a problem from a fresh perspective and disregard any misguided preconceptions of the time. Because of this he was capable of coming up with what seemed like wild theories to others. With hindsight it seems like about half of these ideas turned out to be right while the others really were just too wild, or perhaps some of them are still ahead of their time. In 1935 Zwicky published his theory in collaboration with Walter Baade that when supernovae explode they leave behind them a star with the density of nuclear matter made of neutrons. They predicted that these neutron stars were responsible for cosmic rays and proposed Supernovae as standard candles for measuring distances to other galaxies. Today these ideas are so much a standard part of our astrophysics that it is hard to appreciate just how revolutionary they were at the time. Neutrons had just been discovered two years earlier while cosmic rays had only been observed since 1912. Even the term “supernova” had only been coined in 1926 by Zwicky himself. To other scientists of the time, putting these new ideas together in such a way must have seemed like just a historical trick that was too much to swallow. In fact the theory was based on sound reasoning and built on the theory of white dwarfs as a Fermi gas which had developed over the previous decade. At the same time as Zwicky and Baade proposed their theory of supernovae another controversy was raging on the other side of the Atlantic between Chandrasekhar and Eddington. Chandrasekhar predicted that there was a limit to how heavy a white dwarf could be before it must collapse to form a black hole. Eddington could not accept that nature would include black holes and argued that relativity must be modified in such extreme circumstances to avoid the Chandrasekhar limit. Astronomers now believe that the neutron star is the densest stable state before this limit is reached. The resistance towards these ideas persisted so long that when pulsars were observed 32 years later, few people were prepared for the discovery. The pulsing radio signals observed by Jocelyn Bell in Cambridge were at first thought to be interference and then alien signals. Bell’s supervisor Antony Hewish could not accept the observation at first because the strength, rapidity and regularity of the signal meant that it had to come from a small dense source. It was not until the following year that Thomas Gold and Franco Pacini proposed that pulsars were rotating neutron stars. When Stephen Hawking heard of the discovery that neutron stars exist he told Hewish that now they must accept that black holes too are out there in space waiting to be found. There is a story that in the 1950s a woman member of the public viewed the Crab Nebula source at the University of Chicago’s telescope, and pointed out to the astronomer Elliot Moore that it appeared to be flashing. Moore, told her that it was just the star twinkling due to atmospheric waves. The woman protested that as a qualified pilot she understood scintillation and this was something else. We now know that it is a neutron star that flashes 30 times a second. At the time most astronomers could not have accepted such an explanation. Neutron stars were not Zwicky’s only successful theory. He also believed that galaxies were held together in clusters with unseen dark matter accounting for the gravitational forces needed. he predicted on this basis that such clusters could act as gravitational lenses producing effects that would be observed. he was of course right on all counts but it is only in the last few decades that the theory of dark matter has finally become widely accepted over alternative explanations. Not everything Zwicky thought of turned out to be right. His notable failures include his theory of tired light which he invented because he did not accept the expanding universe theory. Even though such ideas our now discounted, at the time they were not so unreasonable and such alternative theories are important in the development of cosmology and physics as counterfoils against which observations can be used. Nevertheless, in his time almost all of Zwicky’s theories were rejected by his colleagues. He garnered respect only for his careful astronomical observations which included the discovery of over a hundred supernovae, more than any other individual has found. He lived just long enough to see neutron stars become excepted but it took longer for other astronomers to admit he had been right and credit him with the greatness he deserves. He received very few honours for his scientific work but was awarded a gold medal of the Royal Astronomical Society. Who discovered Radioactivity? Every physics student has heard the story of how Henri Becquerel made the chance discovery while studying the effects of light on chemicals using photographic plates in 1896. He normally exposed the chemicals to sunlight and then left them on a photographic plate in a dark drawer to see if they would expose the plate. One day he was trying the experiment with some uranium salts but the sky stayed cloudy, so he put the plates and chemicals in the drawer without the exposure to wait for better light. When he took them out he decided to develop the plates anyway and was surprised to find that they had been darkened despite the lack of light. He had discovered the effects of radioactivity. Becquerel was awarded the Nobel Prize in 1903. His contribution is further recognised in the modern name for the unit of radioactivity. What most people don’t know is that the same discovery had been made some four decades earlier by Abel Niepce de Saint-Victor. Like Becquerel he was studying the effects of light on various chemicals and was using photographic plates to test the reaction. He also used uranium salts and found that they continued to blacken the plates long after any exposure to light had been stopped. Fluorescence and Phosphorescence had been known for many years and Niepce knew that this new observation did not conform to either phenomena. He reported his results to the Academy of Sciences in France several times. A few scientists including Foucault commented on the findings but no-one had a good explanation. Surprisingly no-one seems to have tried to replicate them and it is likely that everyone thought that there was most likely some experimental error. In any case Niepce and his discovery were soon forgotten. When Becquerel rediscovered the same result as Niepce the situation was very different. By then X-rays were known and physicists were ready to appreciate that another new type of ray could exist. One physicist Gustave Le Bon pointed to the prior work of Niepce de Saint-Victor but he was ridiculed. Any further chance that Niepce might gain some recognition were extinguished when the Nobel Committee awarded the physics prize to Becquerel. The story of Abel Niepce de Saint-Victor is typical of what happens to scientists who make a discovery whose importance is not recognised at the time. You would expect that when the effect is rediscovered later, people would appreciate the original discoverer, but that is not what happens. Usually the new discoverer gets most or all of the credit and the original scientists contribution is neglected because he failed to grab everybody’s attention, even if he managed to publish the result six times. In this case it is only in recent years that some small amount of appreciation for the work of Abel Niepce de Saint-Victor has finally emerged. You are currently browsing the viXra log blog archives for April, 2010.